A very interesting pattern with a lot of visual movement. 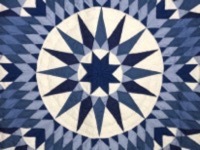 Excellent quilting. 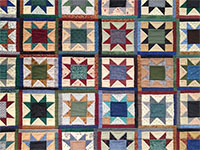 An appealing quilt with a great variety of earth and jewel-tone fabrics. 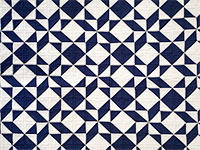 The Flying Geese borders provide a strong visual frame for the multiple stars. 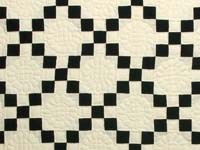 The basic 9-Patch Pattern done in a contemporary way with black against an off-white background. The sawtooth inner border frames the overall pattern and adds an additional element of visual interest. 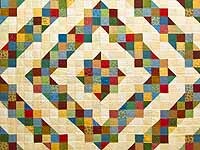 A creative and very interesting adaptation of the traditional Log Cabin Barn-raising pattern, utilizing square and triangular pieces rather that rectangular Noteworthy, too, is how the narrow inner border strips effectively frames the overall pattern. A basic but appealing 2-color pattern with lovely stitching. 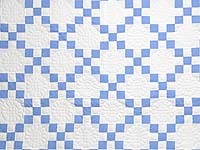 It can be ordered in various shades of blue or in any other solid color. 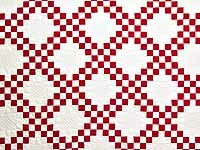 Dramatic red and white with lovely quilting. 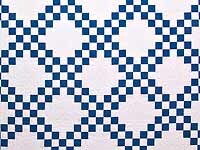 A popular traditional quilt pattern. 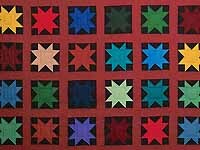 Black background fabric enhances the beauty of the solid color stars. 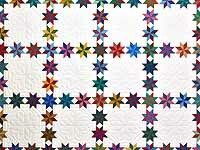 In addition, the quilting pattern on the setting strips complements the star shapes and adds an appealing tactile quality.